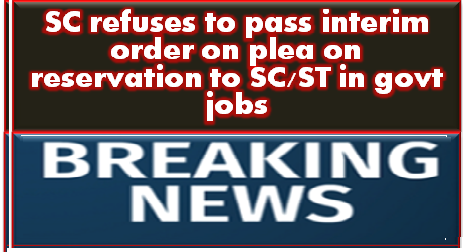 The Supreme Court on Wednesday refused to pass an interim order against its 2006 verdict which dealt with the application of the ‘creamy layer’ for reservations to SC and ST categories in government job promotions. A bench of Chief Justice Dipak Misra and Justices A.M. Khanwilkar and D.Y. Chandrachud said a seven-judge Constitution bench is needed to consider the 2006 verdict M Nagraj verdict. Attorney General K.K. Venugopal, appearing for the Centre, said the matter should be heard urgently by a seven-judge Constitution bench as lakhs of jobs in Railways and services are stuck due to confusion over various judicial pronouncements. The M. Nagaraj verdict had said the creamy layer concept cannot be applied to the Scheduled Castes and Scheduled Tribes for promotions in government jobs like two earlier verdicts – 1992 Indra Sawhney and others versus Union of India (popularly called Mandal Commission verdict) and 2005 E.V. Chinnaiah versus State of Andhra Pradesh – which dealt with creamy layer in the Other Backward Classes category.